1. Connections matter. And because those matter, so does networking and networking events. I'll be the first to tell you that I despise anything with the word "networking" in it; it always feels so fake to me. However, every single one of my current clients have been word of mouth referrals or clients that I've gotten by talking about myself (which I'm still terrible at). 2. Expect the unexpected. When I left teaching, I had two incredible clients under my belt with a goal of getting a third major client by December. Imagine my elation when I picked one up in October - way ahead of my goal (hashtag winning). And yet, imagine my disappointment when I lost my biggest client just two days after the big #3 gain. 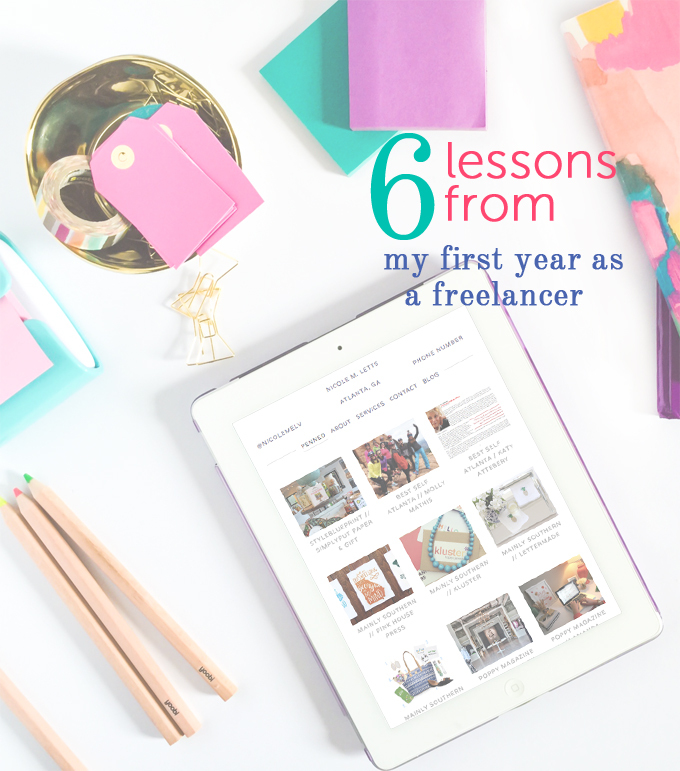 Losing clients (and gaining new ones) is just a part of being a freelancer. And while it can be stressful not knowing where the next paycheck is coming from, really, it's one of the best parts. Gaining new clients keeps my work interesting, and it's definitely kept me on my toes. Plus now, I can proudly say I'm at what I like to call "full capacity." 3. Go with the flow. And your flow isn't the same as someone else's. It has been a year of me learning how other people work. For every single client, that means learning their schedule, understanding their work culture, molding to their meeting times, and compromising my own ideal schedule in the process. If you don't know me personally, you might not know that I'm extremely Type A. I plan my schedule weeks in advance. And I don't do change so well. So, when I'm thrown a curve ball, as I have been many many times this year, it's pretty hard for me to knock it out of the park. The good news is that I recognize this in myself, and that I'm trying every day to improve and go with the flow. 4. If you build it, they might not come. It turns out that it takes a lot more than a business name, a business plan, and a bank account to get work. Not succumbing to Bravo in the middle of the day and choosing to put my head down and work has been an adjustment. While I really hate the word "hustle," there is definitely a sense of urgency needed with freelancing. Otherwise, you're not getting paid. 5. Make friends who get it. I cannot express how thankful I am for my freelancing and small-business owning friends who have been a sounding board for me this year. Not only have they kept me sane, but they've offered sound advice via text, chance meetings in the driveway, and over coffee. 6. Your passion doesn't have to be your work. Hear me out. Working in "your passion" is a huge trend right now. Every time I tell someone I left teaching, I hear the phrase "well now you get to work in your passion!" Let's be clear: social media isn't my passion (not really) and teaching wasn't not my passion. In fact, I am still deeply passionate about education. And education is very very very much a part of my daily work. I get to educate clients about best social media practices. I get to help them make their businesses stronger. I get to help them create a brand that matches their vision. I get to help people. And that is awesome, and that I am passionate about. Fellow business owners: what are some of the lessons you've learned?